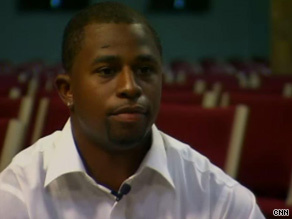 RICHMOND, Virginia (CNN) -- Twenty-year-old Sean Branch searched for eight months for a job with no success. Summer worker Sean Branch, 20, says he grew up in Brooklyn, New York, surrounded by violence and gangs. "I go everywhere from big-time places to just mom-and-pop shops, and nobody's hiring," Branch said. Now, thanks to the $1.2 billion set aside for economically disadvantaged youth in the economic stimulus package, Branch is one of thousands across the country who have been given an opportunity to work this summer. President Obama promised the allocation will create 125,000 summer jobs. The funds primarily target low-income youth between 14 and 24 so they can receive necessary job training and pick up social and school skills to prepare themselves to enter the work force. Depending on their age, the youths have the opportunity to work between 20 and 32 hours a week at $7 to $8 an hour. Over the last several years, youth employment has been on a steady decline. According to the Center for Labor Market Studies at Northeastern University, youth employment fell to a record low of 30 percent in May, down from 45 percent in 2000. According to Thakur, the National Youth Employment Coalition, which boasts a network of 250-plus organizations nationwide, has "doubled, tripled, quadrupled the numbers of young people that they're working with and providing jobs to." Robert Bolling, executive director of the William Byrd Community House in Richmond, was able to find work for Branch and more than 200 other youths this summer with $439,000 his organization received from the stimulus. "It is very difficult for a young person with no job skills at all to compete in a marketplace where individuals are losing work all the time," Bolling said. "The stimulus money provides a chance for these young folks to gain skills that they need to compete." Branch, who said he grew up surrounded by gangs and violence in Brooklyn, New York, said he's thankful to get past those obstacles. "Just walking into an office, somebody like me, I'd never think in a million years that I'd ever [have] an opportunity to just sit in a beautiful office, air-conditioned, and just file papers. I'd never think that," Branch said. Some critics such as U.S. Rep. Eric Cantor, R-Virginia, question whether temporary summer employment is the most effective use of stimulus money. While Cantor says that summer jobs programs are positive and help young people look forward to the future, "I think the American people are just frustrated at seeing their taxpayer dollars wasted." "When you say that you want to see a stimulus bill work, they, the American people, expect that stimulus bill will be focused like a laser on creating jobs." To critics, Thakur said $1.2 billion is a small slice of the stimulus pie and that these programs do have long-term benefits. "Summer jobs are really building blocks for year-round and longer term experiences for youths in the labor market and also for broader skill development," Thakur said. "Employing young people and providing them with critical education and skill development is really critical to the labor market of the future." And there is more to these programs than meets the eye, Thakur said. "It really assists a lot of working families right now who don't know how they're going to manage their children over the summer ... and the fact that they can also earn money and contribute to the economy and their family is probably a key feature this summer when families are really scaling back." In Richmond, estimates are that every summer job costs between $1,000 and $2,000 in stimulus spending. It is a one-time cash infusion, so programs across the country will need to look elsewhere to maintain the current level of funding next year. Bolling said he isn't concerned about funding running out at the William Byrd Community House but is instead focusing on the present. "If we don't take these small steps, we won't be prepared for the future," Bolling said. "We think there's enough resources out in the private sector to help support the initiative after the government fund goes out." For now, Branch will finish out the summer working, but he said he hopes other youth plagued by similar challenges will learn from his examples. "The big goal is to put myself in a position as a leader and be able to march out to the kids," Branch said. "I just want to be a guide and keep the kids that don't have the opportunity like everyone else to focus and do what they need to do, whether it's sports, whether it's just anything they like to do to keep them positive and doing what they need to do."